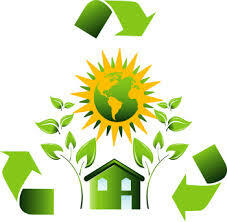 A Net Zero Building is a building which produces as much energy as it uses over the course of a year. Currently, there are only a small number of highly efficient buildings that meet the criteria to be called "Net Zero". As a result of advances in construction technologies, renewable energy systems, and academic research, creating Net Zero Energy buildings is becoming more and more feasible. Amid growing concerns about rising energy prices, energy independence, and the impact of climate change, statistics show buildings to be the primary energy consumer in the world. The building sector can significantly reduce energy use by incorporating energy-efficient strategies into the design, construction, and operation of new buildings and undertaking retrofits to improve the efficiency of existing buildings. 1. Isolation for building owners from future energy price increases. 2. Reduced total cost of ownership due to improved energy efficiency. 3. Reduced total monthly cost of living. 4. Reduced risk of loss from grid blackouts. 5. Improved reliability - improved reliability – photovoltaic systems have 25-year warranties and seldom fail during weather problems – the 1982 photovoltaic systems on the Walt Disney World EPCOT Energy Pavilion are still working fine today, after going through three recent hurricanes. 6. 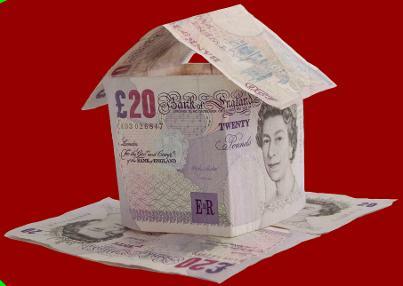 Higher resale value as potential new owners demand more zero energy buildings. 7. The value of a Zero Energy Building relative to similar conventional buildings will increase every time energy costs increase. 8. Future legislation and carbon emission taxes/penalties may force expensive retrofits to inefficient buildings. 1. Initial costs can be higher. 2. 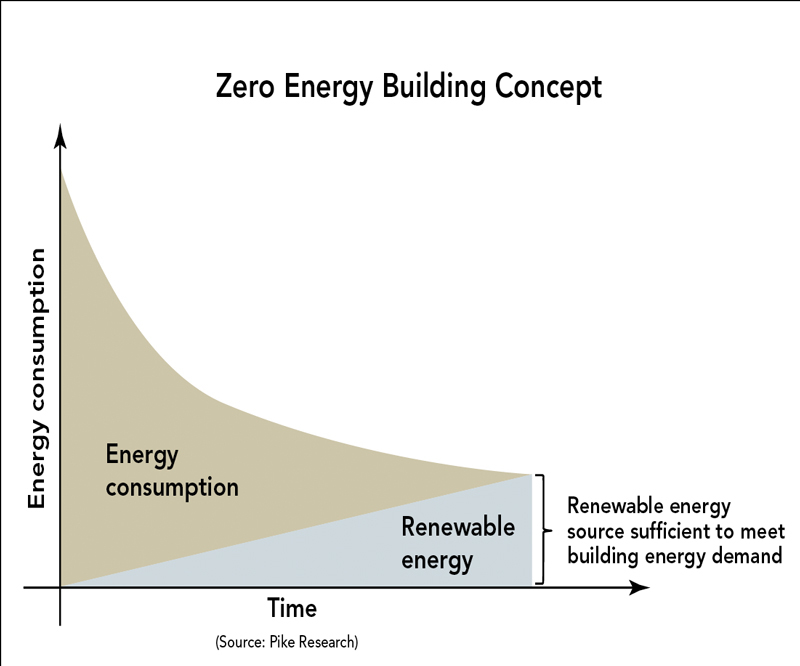 Very few builders or designers have the necessary skills or expertise to build zero energy buildings. 3. Photovoltaic Solar Cell prices have been falling at roughly 17% a year - this will lessen the value of the capital invested in a solar electric generating system. Subsidies are being phased out as photovolatic mass production lowers future price. 4. There is a challenge to recover higher initial costs on resale of building, but new energy rating systems are being introduced gradually. Appraisers are uninformed - their models do not consider energy. 5. While the individual house may use an average of net zero energy over a year, it may demand energy at the time when peak demand for the grid occurs. In such a case, the capacity of the grid must still provide electricity to all loads. 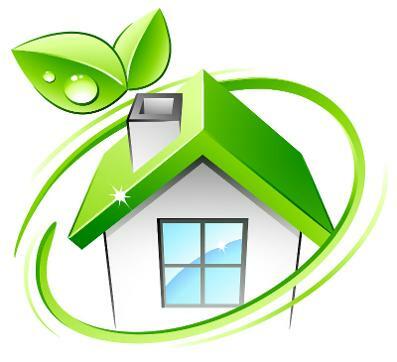 Therefore, a Zero Energy Building may not reduce the required power plant capacity. 6. Without an optimised thermal envelope the embodied energy, heating and cooling energy and resource usage is higher than needed. 7. 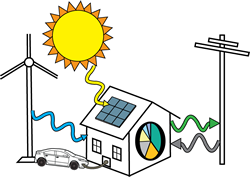 Solar energy capture using the house envelope only works in locations unobstructed from the sun. 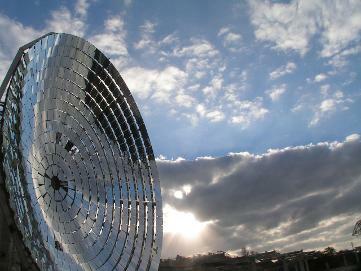 The solar energy capture cannot be optimized in north (for northern hemisphere, or south for southern Hemisphere) facing shade, or wooded surroundings. 8. Climate-specific design may limit future ability to respond to rising-or-falling ambient temperatures (global warming). The goal of green building and sustainable architecture is to use resources more efficiently and reduce a building's negative impact on the environment. Zero energy buildings achieve one key green-building goal of completely or very significantly reducing energy use and greenhouse gas emissions for the life of the building. 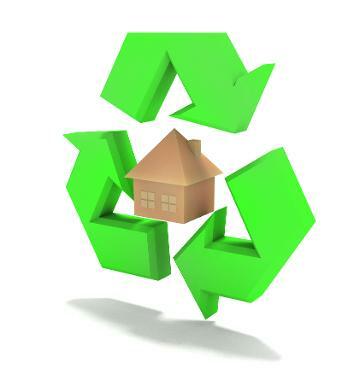 Zero energy buildings may or may not be considered "green" in all areas, such as reducing waste, using recycled building materials, etc. However, zero energy, or net-zero buildings do tend to have a much lower ecological impact over the life of the building compared with other "green" buildings that require imported energy and/or fossil fuel to be habitable and meet the needs of occupants.